Protests and looting rocked a North Carolina city early Wednesday, following the fatal police shooting of a black man, with a dozen officers and several demonstrators injured in the violence. Media reported that several hundred people gathered to protest the shooting of 43-year-old Keith Lamont Scott, who was African-American, as was the officer who killed him. The shooting was the latest in a string involving black men killed at the hands of police, which has fueled outrage nationwide. 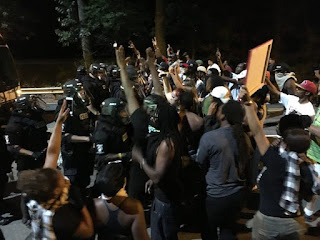 Demonstrations began late Tuesday and grew through much of the night near an apartment complex in the city of Charlotte, where the shooting occurred. Later in the night, some protesters in Charlotte set fires blocking a major road, and others set trucks ablaze, according to news reports. A local television station reported that looters attempted to break into a Walmart store — some throwing rocks and shattering glass doors — and were held back at the entrance by officers. The violence comes just days after another police shooting, captured on video, of an unarmed black man in Tulsa, Oklahoma. Together, they are the latest in a series of recent police shootings — from Baton Rouge, Louisiana to Dallas, Texas — that have left the African American community demanding law enforcement reforms and greater accountability from public officials. News reports said the officer in Tuesday’s shooting, Brentley Vinson, has been put on paid leave. WSOC-TV reported that the Charlotte shooting occurred as Vinson and other officers were searching for a suspect on an outstanding arrest warrant. Police encountered Scott — who was not the person they were seeking — in a car parked at the building. “At this point, all we know (is) they were in the apartment complex parking lot,” Charlotte-Mecklenberg Police Chief Kerr Putney told reporters late Tuesday. Police said Scott had a firearm, which is legal under local law “open carry” gun laws. His relatives told local media, however, that he was not carrying a gun, but had a book in his hands when he was gunned down. Charlotte police donned riot gear and used tear gas as they tried to subdue the angry crowd, which authorities said attacked and damaged several police cars over the course of the night. Meanwhile, Charlotte Mayor Jennifer Roberts appealed for calm. The fatal shooting in Tulsa last Friday of Terence Crutcher was recorded by police car dashboard cameras and a police helicopter camera. In the video, the 40-year-old Crutcher is seen with his hands up, appearing to comply with police officers and leaning against his car. He is then shot once by officer Betty Shelby, and falls to the ground. Another officer fires his stun gun. The US Department of Justice said on Monday it would conduct a federal civil rights probe, an investigation parallel to the one local authorities in the state are carrying out. I'll advise African American to start visiting African countries and see the difference..You guys don't wanna go out to see what African countries have become. The problem is over reliance on the bad side of African countries being portrayed by the Western media. African has come of age and transcends the jungle they portrayed in the media. Black Americans are the only people that have refused to travel to their fatherland, white people go to Africa to invest and sometimes stay over and naturalised because of the beauty of Africa, but the same white man told Black Americans not to go to Africa because they gonna get killed. What an irony.